Made from 100% raw, natural, organic, GMO and pesticide free produce, Blendfresh Protein contains 8+ Fresh-Dried, vegetarian, dairy-free complete protein ingredients. Provides all essential branch chain amino acids.. When following a diet that is primarily plant-based, getting enough protein each day is vital for healthy lean muscle development. 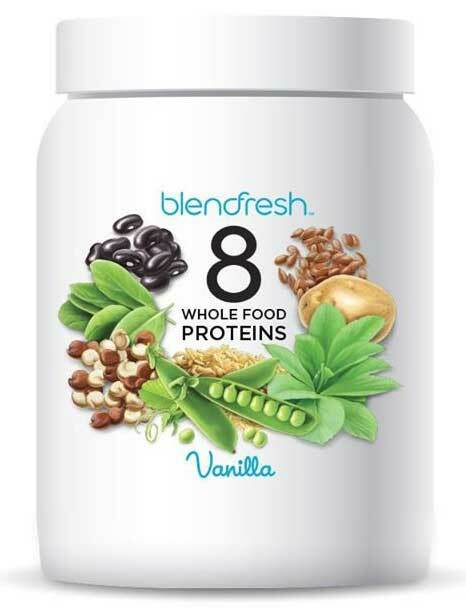 Blendfresh 8 Whole Food Proteins blend contains 20 grams of protein from a diverse blend of eight seeds, legumes, beans, and whole grains which includes peas, quinoa, rice, potato, black beans, flax seed, alfalfa, and spinach.